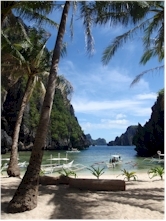 El Nido town. 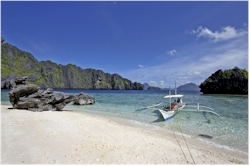 The town of El Nido is small and in itself nothing special. So, what gets travellers to this remote place on this remote island? Three words: location, location, location! 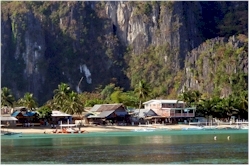 On the landside the town is surrounded by hills and impressive limestone cliffs. On the seaside its located in a sheltered bay protected by Cadlao Island, the largest island in the archipelago which also has the highest peak; a guarantee for stunning sunsets when you're on the town's beach. The town gets its name from birdsnests ("El Nido" is "The Nest" in Spanish) that can be found in the various caves in the area around the town. 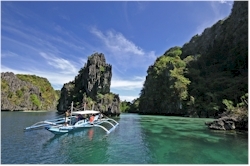 Since several centuries, El Nido has been visited by Chinese traders looking for edible nests of swiftlets that are an expensive delicacy for soup in Chinese cuisine. This is a seasonal activity that is still being performed here. Traditionally, agriculture and fishing were the main economic activities here but recently, tourism has become increasingly important. Travellers only discovered the area in the 1980's. 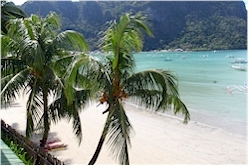 While in the beginning it were mainly divers and backpackers, in the meantime several luxury resorts have opened around the town and on the islands. The main activities for visitors are related to the natural beauty: beaches, diving, snorkeling and island hopping. Nature reserve. The wide area around the town is a protected nature area and this both terrestrial as maritime. Most important on the land are the geological formations with impressive karst limestone cliffs (comparisons with Halong Bay in Vietnam or Krabi in Thailand are not coincidental), forests and mangrove woods with several species of endangered endemic birds and mamals. In the water there are important coral formations, marine animals, some endagered species of turtles and fish making the Bacuit Bay area an interesting diving spot. Travel tips. Tourism is becoming increasingly important here, so better go sooner than later if you like to get the best out of it and enjoy it without too many other travellers around. Many places do accept cards for payment but don't rely too much on the presence of working ATM's in the area so bring some cash.